Zimbabwe’s Health Minister Dr. David Parirenyatwa addressed journalists in Harare, Monday, declaring an end to the weeklong strike by the country’s government-employed nurses. “So the update really is just to say the issue of industrial action for nurses so far has closed. The nurses are largely back at work. We welcome them, we’re happy with that ourselves,” Dr. Parirenyatwa said. Contrary to reports that all the country’s close to 17,000 nurses had participated in the industrial action that, Dr. Parirenyatwa said only one-third - 5, 974 out of 16, 974 - nurses had actually taken part. 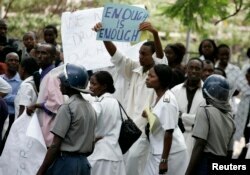 FILE - Zimbabwean riot policemen stand in front of doctors and nurses who are demonstrating over the deteriorating health system, outside Parirenyatwa group of hospitals in Harare. Sticking with the announcement issued by Vice President Constantino Chiwenga that all striking nurses would be fired, Dr. Parirenyatwa said while the government welcomed the nurses to reapply for their jobs, the Health Services Board would determine who will keep their jobs. Dr. Parirenyatwa said the government got through the strike by using non-striking nurses, and reaching out to unemployed, retired and on-leave nurses to staff the hospitals. “We have utilized nurses who did not participate in the industrial action and they’ve been beefed up by the recruitment of qualified nurses who were not employed. Our unemployed nurses and also the retirees, those aged between 55 years, who went for early retirement and 70-years. But also what we did was to make sure that during that time, all official leave was cancelled and they were recalled to duty, to beef up everybody,” Parirenyatwa said. Winnie Soko was among the retired group of nurses who applied for the fill-in positions. “All I want is a job and I don’t have one but I am qualified for the job. I don’t have anything to do. I stay at home, so I want this job to get a salary,” explained Soko. While that hospitals were staffed and functions of the various institutions back to normal, Dr. Parirenyatwa took issue with the striking nurses, saying they should have been more patient. 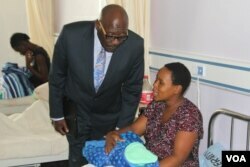 FILE: dR. David Parirenyatwa visiting Zimbabwean hospitals. Nurses on the other hand, said the government was wrong to respond to their call for better salaries and working conditions, by terminating their contracts publicly, on national television. Kingston Mutsinzwa, a representative of nurses’ union, said they gave the government two-weeks’ notice before embarking on industrial action. "Legally, our contracts cannot be terminated through a television announcement. If the government feels that the strike action is not legal then that's unfortunate because we gave them 14-days notice but they did not respond. Their claim that we do not have the patients at heart is also untrue." To counter the government’s claim that nurses do not care for their patient’s well-being, the striking nurses gave free clinical advice to patients at the Unity Square in Harare. While reprimanding the nurses for going on strike, Dr. Parirenyatwa acknowledged the complaints by the nurses of pay disparities, poor working conditions and other issues that nurses raised as a basis for striking, top of which was poor salaries. 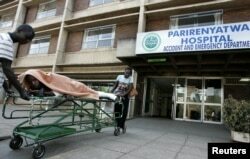 FILE: A patient is taken home on a stretcher by his relatives from Parirenyatwa hospital's accident and emergency ward in the capital Harare August 21, 2009. Nurses earn as little as $284 a month before housing and other allowances. “It is important to know that that was part of the major complaint outside the issues that we all know, that we really need to improve the infrastructure in our hospitals, which we are all alert to, and government is very ceased with that,” said Dr. Parirenyatwa. Sarah Nyambi, a nurse, said it’s impossible to take care of her family on her current salary. "I am not able to give my kids what they deserve to get, even the school that I am sending my children is not the school they are supposed to go to. As a nurse I expect to send my child to an A school but they just go to a B school because I cannot afford with my salary. I have to do something else so that I get more income for my children." In ending their strike over the weekend, the Zimbabwe Nurses’ Association issued a statement explaining that they decided to return to work before reaching an agreement with the government, because the strike had become too politicized.